Death of a New American—now in stores! In 1912, as New York reels from the news of the Titanic disaster, ladies’ maid Jane Prescott travels to Long Island with the Benchley family. Their daughter Louise is to marry William Tyler, at their uncle and aunt’s mansion; the Tylers are a glamorous, storied couple. Charles Tyler is battling New York’s notorious Italian mafia, the Black Hand, and his wife Alva has settled into domestic life. Jane quickly befriends the Tyler children’s nanny, Sofia—a young Italian-American woman. However, one unusually sultry spring night, Jane is woken by a scream from the nursery—and rushes in to find Sofia murdered, and the carefully locked window flung open. The Tylers believe that this is an attempted kidnapping of their baby gone wrong; a warning from the criminal underworld to Charles Tyler. But Jane is asked to help with the investigation by her friend, journalist Michael Behan. Was Sofia’s murder fall-out from the social tensions rife in New York, or could it be a much more personal crime? "I'm loving this series! "―Alyssa Maxwell, author of the Gilded Newport Mysteries. 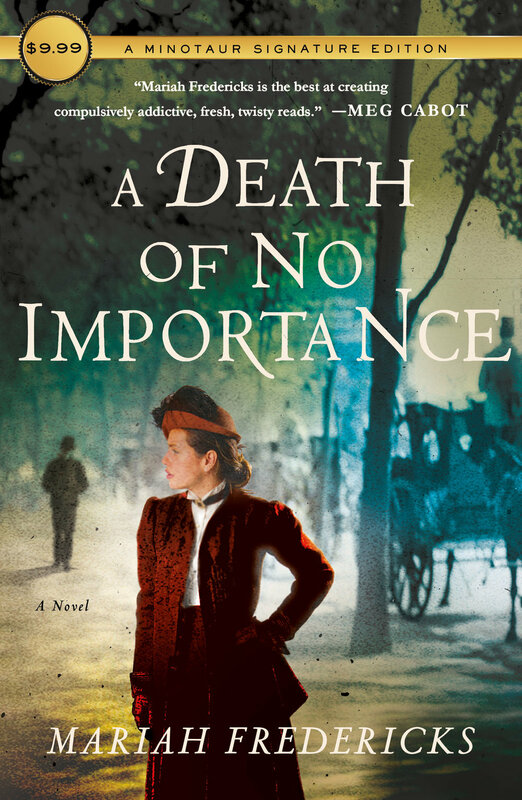 A Death of No Importance—now in paperback! A Library Journal Best Book of 2018! If it is your job to make sure the silver is clean, you must have a sharp eye for tarnish. New York, 1910—a time of great wealth and greater inequality. Orphan Jane Prescott is a lady’s maid for the nouveau riche Benchley family. When Charlotte Benchley becomes engaged to the socially prominent Robert Newsome Jr., murder is in the air. And when the groom-to-be is found battered to death, Charlotte tops the list of suspects. As the woman few people notice, but who notices everything, Jane scrambles to keep the Benchleys out of a scandal—and Charlotte out of the electric chair. To buy A Death of No Importance, head over to your local indie or any of the following websites. In a starred review, Publishers Weekly called this a "haunting psychological thriller" and "profound, provocative commentary on what it means to grow up in the age of Facebook." When Wendy Geller's body is found in Central Park after the night of a rager, newspaper headlines scream,"Death in the Park: Party Girl Found Strangled." But shy Rain, once Wendy's best friend, knows there was more to Wendy than just "party girl." As she struggles to separate the friend she knew from the tangle of gossip and headlines, Rain becomes determined to discover the truth about the murder. Leo, Max, Jane, and Daisy don't have much in common. But when they all blow off their SAT prep in favor of forming their own study group, they actually begin to bond — over why there's so much competition over a stupid test. And what it really measures, anyway. Then it's revealed that someone has cheated on the SATs, and all eyes point to the study group. The pressure is on for the cheater to come forward. Who will confess?